Why would I need a worm egg count? Most people who have equines in their care should use worm egg counts in their equine health management program. It should be as necessary as a farrier's visit , horse dentist or vaccination program. "What good is a worm egg count?" A worm egg count will help you monitor the health of your horse, and is recommended to test the efficiency of your worming program. It will give you peace of mind that your worming is correct and your horse healthy or it will indicate whether there is a problem that needs addressing. Reason To make sure that your worming program is working and killing the worms. We have many clients who have owned their horse for a number of years and worm regularly but the horse has a large worm burden. Take a dung sample between May and August just before you are next due to worm. You should expect a reading under 100epg. If it is higher than this then your current worming program is ineffective. Contact one of our consultants or your vet for advice. This is of particular importance in young or old horses who cannot go the maximum length between wormers as their immune system is not strong. Reason To test for worm resistance to chemicals. This is of particular importance to ensure that the wormers you are giving your horse are actually working, and that you are not inadvertantly helping the worms. Take a dung sample just before you are next due to worm, and then another one ten days after worming. You should expect the reading to be reduced by at least 85%. If it is not then the worms that your horse is carrying are resistant to the chemical. In every yard that we have registered there is at least one horse has had worms that are resistant to some chemical wormers or who does not respond to herbal wormers. This is a major cause of the build up of worms in an individual horse. The owner is worming the horse but it is not killing the worms..
Reason To identify the horses and ponies that are carrying a high worm burden. Only 20% of horses in the UK are considered to have a high worm burden but approx 80% of them are wormed as if they had. It is recommended that by identifying the 20% and treating accordingly we can slow down the speed at which worms are becoming resistant to chemicals. This will also reduce the chemicals being administered to horses unnecessarily. Take a dung sample between May and August after the horse has been free of chemical coverage for approx two weeks. The horses that need treatment will have a reading over 200epg. Treat the horse with a reading over 200epg with an appropriate chemical. Horses with a reading below 200epg do not necessarily require chemical treatment, depending on their risk assessment. WARNING It is dangerous to the health of your horse to completely stop worming without undertaking a risk assessment and ensuring that encysted worms, tapeworms and bots are still treated. Reason Investigation of weight loss and/or colic after worming. Worms can cause both weight loss and colic and it is important to see what level of active adult worms there is in the horse. Take a dung sample, no earlier than two weeks after a wormer application. Contact one of our consultants or your vet for advice. A tapeworm antibody test is advisable for the detection of tapeworm. It is the ONLY test available. Your vet can arrange this with the University of Liverpool. The major cause of both of these conditions are tapeworm and encysted small redworm. Neither of these are visible on a worm egg count and so a low result should be taken with caution in this situation. Your vet should be contacted immediately if your horse or pony has colic symptons, appears poorly or you suspect a worm problem. Reason To assess the worm level of a new horse or pony. New horses can upset the worm levels in fields and paddocks. It is important to get an indication of the exisiting worm levels in a new horse. Take a dung sample, no earlier than two weeks after a wormer application. You will need to check when the horse was last wormed and if necessary keep him isolated and collect dung from his paddock until a sample can be taken. The reading will be an indication only and should be determined in conjunction with your vet or one of our consultants. Whatever the reading is the horse should be given a five day Panacur Equine Guard treatment as soon as the dung sample has been taken, and two weeks later an Equitape. If the first worm egg count is positive then a second worm egg count should be taken 10 days after giving the Panacur Equine Guard. WARNING: Please consult your vet or one of our consultants if you have a broodmare or foal before giving the second treatment. We have many recorded instances whereby grazing companions have had very low levels of worms or none at all and then two months after a new horse was introduced the readings are over 1000epg. We have yards with over 50 horses on Intelligent Worming programs and all new horses are tested for worms on arrival.worms. Reason To test for pasture contamination. Paddocks and fields can have different levels of worm larvae in them which will affect horse rotated around different pasture. Take a dung sample upon the horse entering the new pasture and then take a second sample six weeks later. If the reading has increased then this could be due to pasture contamination. 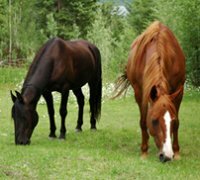 Treat the horse with a chemical wormer and improve the pasture maintenance /management. Ideally rest the pasture for at least six months and cross graze with sheep. Contact one of our consultants or your vet for advice. WARNING The diagnosis of pasture contamination can only be made after you are sure the horse does not have an encysted level of worms. It is the last option in a series of diagnostic alternatives. We have yards on Intelligent Worming programs where we have identified contaminated fields and know that when horses are grazing those fields they need stronger chemical coverage, but when they move into other fields there are no larvae and so chemicals can be reduced. Are all horses in the field on the same worming control program. What is the stocking rate? "How can Wormers Direct Help Me?" The best time to call or email our consultants is before you do the worm egg count to discuss your objectives with them. The effectiveness of the worm egg count result can vary at different times of the year and the same reading has different interpretations according to the season the sample was taken.